A few days ago a came across a photo which showed what appeared to be a digital advertisement screen in a restaurant in Oslo. 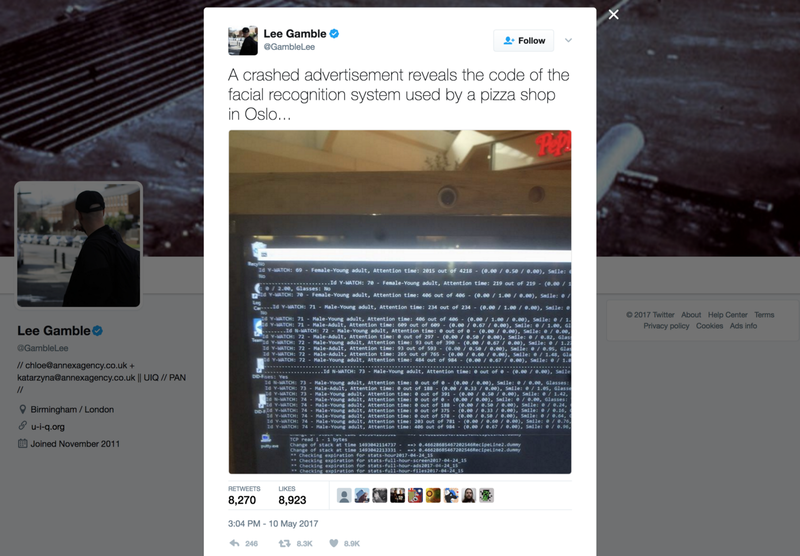 However, the software running the advertisement screen had crashed and was revealing a log of what the software was doing. It turns out, the advertisement screen was using a camera to automatically profile everyone that passed by. After sleeping on it, this reminded me of the increasing number of digital advertisement screens I’ve seen popping up around Dublin City. You’ve probably seen them too, they are pretty eye-catching. Here’s what they look like, this one is in Capitol Bar. 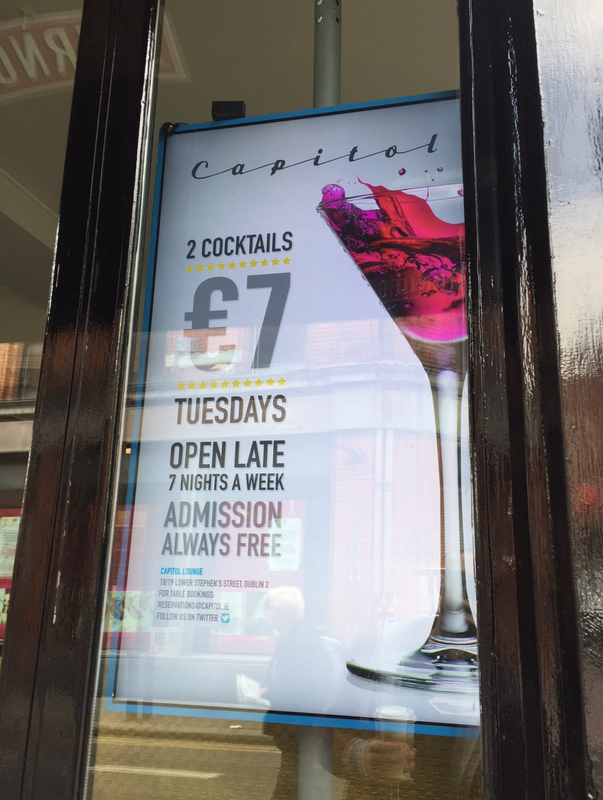 (There are at least two in Capitol Bar). The company behind this screen is called “Orb”, their website can be found here: http://orbscreen.com/ They have about 70 screens spread across Dublin, Cork and Galway. 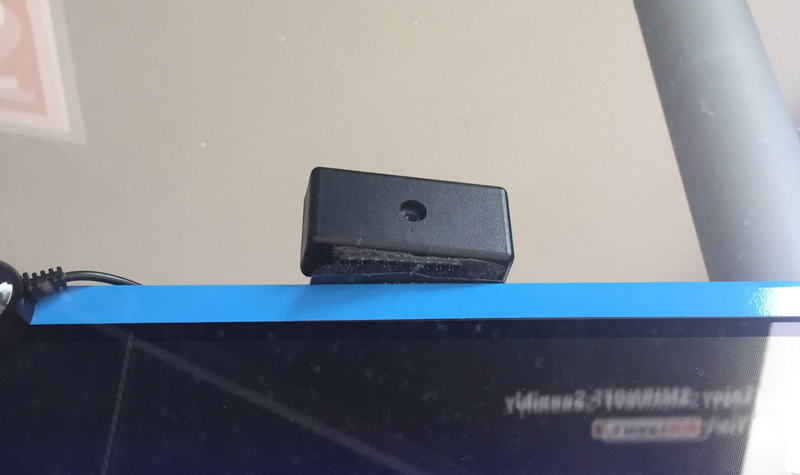 From speaking with Orb, I’ve discovered that approximately 10 of the screens are equipped with cameras, but they intend to increase this number soon. If you didn’t notice, there’s a small camera that sits at the top of some of these screens. These cameras are used to track* and identify the behaviours of everyone who walks by — you’ll find no signs up to explain this. Children are also included in their profiling, which I discovered based on a conversation I’ve had with Orb over the phone. *note: when I use the word ‘track’, I do so to describe a system’s ability to monitor and track changes in a pedestrian’s behaviour from the moment they enter a cameras field of view to the moment they leave the cameras field of view. Further, according to Orb’s website, this is the list of the attributes they use to understand everyone passing by. 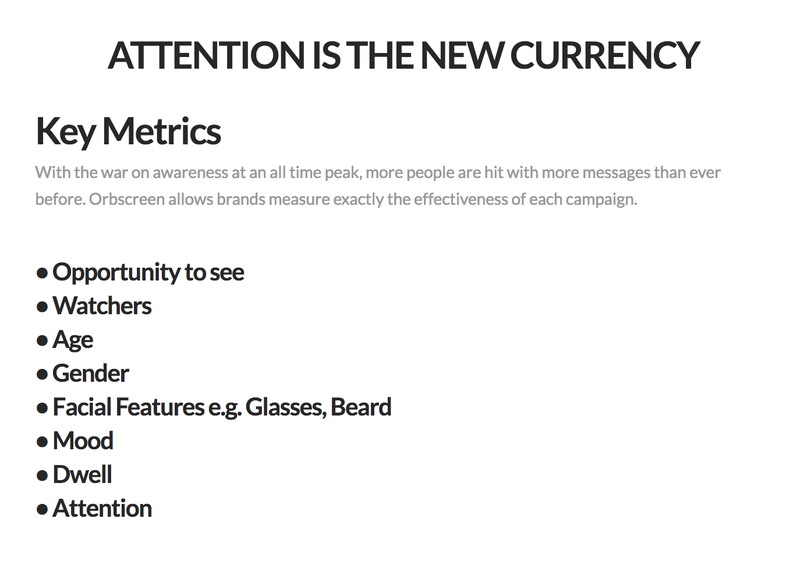 “Attention is the new currency” is the headline here. Your attention (and the meta-data associated with it) is being relayed to advertisers without your permission or awareness, and there is no way to opt–out. This is the crux of problem. There’s no transparency, there is no obvious notice, and there’s no way to opt–out. This is an erosion of our privacy. I feel, this is unacceptable. For instance, with platforms like Facebook, Instagram or Twitter, you have to actively accept their Terms of Service and Privacy Policies before using their product — and even then we’re vigilant regarding what we allow these platforms to do. Ultimately, you can simply delete your Facebook, Instagram or Twitter account if you wish to opt–out. While with these screens, things are a very different. There is nothing obvious to notify you that you’re being tracked or assessed, and there’s no way to opt–out. This is a real problem because it sets a precedent whereby we could lose our privacy. We have no choice here. This is also a private company that’s tracking us without our awareness, not some kind of public service that can at least pretend it exists for the public good. Even if data is somewhat obscured, it is still also possible to cross-reference and coagulate data to create profiling subsets. Data can be chopped up in different ways to easily identity people. 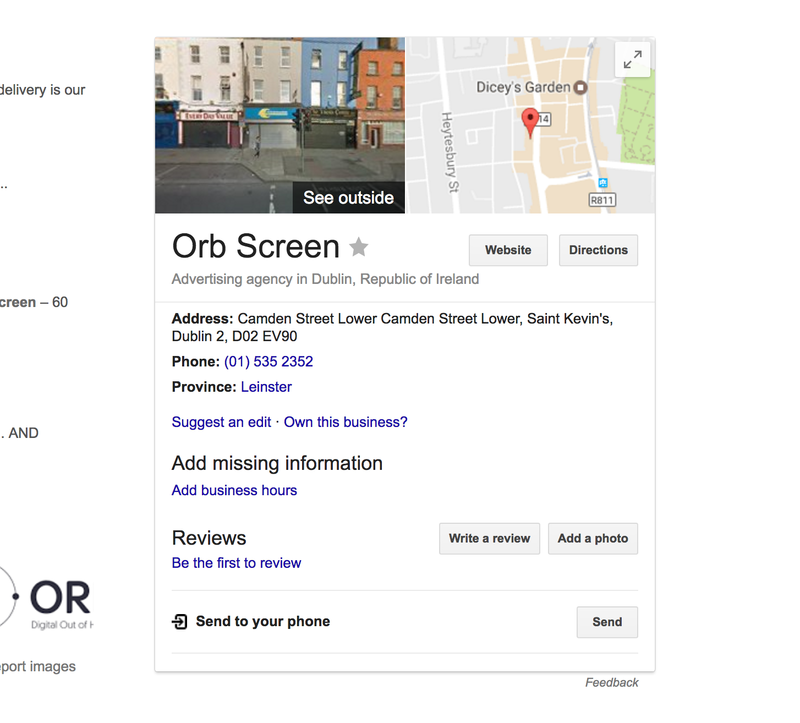 Ultimately, Orb are already profiling hundreds of thousands of Dubliners ever month, in great detail, without any apparent notice, and then they relay this data to advertisers. So, what next? Racial profiling? Religious profiling? To what end? We need to talk about this. 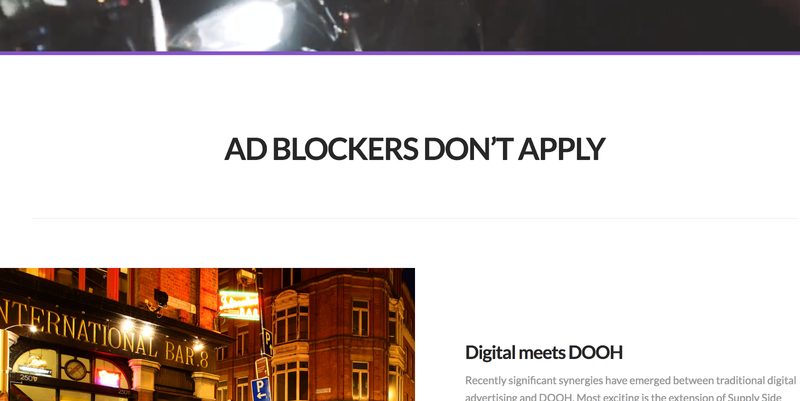 Last but not least, Orb pride themselves on the fact that “Adblockers don’t apply”, which is a very clear way of saying: There is no way for people to opt-out. I feel, this is a gross infringement on our privacy. Right now, millions of Dubliners of all ages are being profiled by Orb, and there’s no way to opt-out. This is not a criticism of technology. The same technology being applied here (most likely, computer vision) is already being used to detect possible Melanomas. Rather, this is an opportunity to have a discussion about how we protect and preserve our freedom to remain untracked and anonymous when on public property. To remain on the point that this is not about technology: Road fatalities are a problem, but they will decrease with self–driving cars, self–driving cars will rely heavily on computer vision. In fact, it will most likely transpire that most human problems are computer vision problems. So, this is not a conversation about technology, but personal sovereignty. We should all be able to move freely without being profiled enmasse with no notice, and if we don’t talk about that, it will continue to happen with increasing levels of resolution and accuracy. If our government wanted to do this, I am sure there would be a strong movement against it. While I will not attempt to speak on the legalities of this subject, here’s what I can say: It is my personal belief that this use of this technology is not entirely transparent or fair. There are groups of people who will use good technology to do distasteful things; and this is what I feel is happening here. Do we stand up to technology that erodes our sovereignty, or do we do nothing and allow things to continue along this trend? Product Designer & Product Manager • Founder (sold my last app) • Investor • Now, I help companies with design leadership • How can I help?